Wow, I can't believe how quickly this year went! And yet it also feels like it's been such a long year. So much has happened, major life changes, and it's hard to believe it all happened in just the last year. May- Finished my 3rd year of college and still no major or direction, but considering I got married and had 2 kids in those years, I think I did pretty good. Oct thru Dec- Holiday season, need I say more? And that's just the major things, there were many little events that went on between those times. It really has been a busy year, especially June lol. But it was a wonderful year, so many great things happened. Hopefully 2007 will be another fantabulous year!!! In church today there were some good speakers. One talked about the need for a person to be active with their faith. Meaning, you don't just believe something, you go out and act on your belief. He quoted someone but I can't really remember it well, but something about reaching the end of the light and stepping out into the darkness, or something like that. It was a good talk. ETA: Just found the quote- "When you reach the end of light in your life and you find yourself standing before a dark abyss, faith is knowing that when you take the next step there will be something solid to walk on or you will be taught to fly." Ten Top Trivia Tips about Kara! Britain's Millennium Dome is more than double the size of Kara! Czar Paul I banished Kara to Siberia for marching out of step. If you lick Kara ten times, you will consume one calorie! In the Great Seal of the United States the eagle grasps 13 arrows and Kara. The first Kara was made in 1853, and had no pedals. Three seagulls flying overhead are a warning that Kara is near. Kara will often glow under UV light. Kara is the only one of the original Seven Wonders of the World that still survives. Contrary to popular belief, Kara is not successful at sobering up a drunk person, and in many cases she may actually increase the adverse effects of alcohol. Four-fifths of the surface of Kara is covered in water. I love Bob Dylan. If you don't know who he is, you need to be shot. He's one of the greatest singers of my dad's generation. I thought this was a great quote. Basically, it doesn't matter if you are rich or poor, what matters is where your heart is. Remember, you can't take your money with you when you die. So this is my 2nd week at my job. It's getting easier and I don't feel so out of place anymore. I still don't like working, I'd rather be home, but at least it's less than 20hrs a week and it won't be for too long. One of my supervisors asked me the other day if I had another job during the day too, I told her, "Yes, I'm a mom." :) Believe me, being a mom and homemaker is definitely a job. 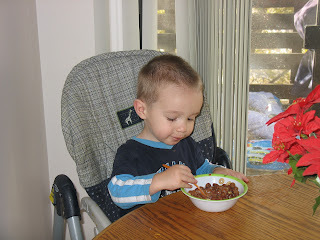 It is kind of nice to have a small amount of time where I don't have to be taking care of the kids, plus it is giving hubby an opportunity to get closer to the boys and learn how to take care of them better (he now understands why the house is always so messy lol). I'm missing my 2yr old today. Sure it's nice not to be following him around cleaning up messes, but I just want to hug him and cuddle him a bit. I'm so used to taking care of him 24/7 that I feel like part of me is missing, or I'm forgetting something. He's having fun down at my family's house though, I'm sure the girls are spoiling him terribly. :) Man, I'm starting to cry now, and he's only been gone 3 days! OK, here's something I just don't get. While I was putting Christmas things away Wednesday I had to put a bunch of lights away. What I don't understand is how they can come all nice and neat in that tiny box, with the little plastic holder thing too, but not fit back in!?! Does the box shrink when the lights are out? I mean, seriously, it drives me nuts! No matter how I fold, cram, or wrap, they never fit back into the box! I end up shoving them in as hard as I can then taping it closed, the box bulging. Why don't they just come in a bigger box? That would make it so much easier on everyone. I'm being too lazy today. I really need to clean the office, cuz there is paper, boxes, and broken pieces of styrofoam surrounding me. Or maybe I can just take a nap while Baby is sleeping. Doesn't that sound like a better use of my time? I think it does. Wow, is it really Thursday already?! I am so tired. I worked until about 10:45 tonight. I'm about to head to bed and hopefully get some good sleep, if Baby cooperates. We got the house mostly cleaned too and it looks so nice and wonderful. Makes me feel a lot less stressed. I'm starting to miss 2 yr old already, but it's kind of nice knowing my house can actually stay clean for a week. So, my 2 yr old is gone to spend a week with my family. It is so weird. I just don't know what to do with myself. Normally my days are full of endless picking up after him. I might actually have a clean house for more than an hour this week! Of course the house is already a complete pig sty from Christmas. I better get a to-do list up so I can see what needs done. I had a really good day today. Hubby got me great gifts. A fluffy white bathrobe, a roaster oven thing, and a gift card to get a massage, manicure and pedicure! I'm very excited for my massage, I love them! I got a few other little things. A few of hubby's gifts got delayed by weather and won't show up until later, but he got a few DVDs and things. I had fun watching 2 yr old open and play with his gifts. After about 3, he got tired of unwrapping presents and just wanted to play with what he had, so we helped him unwrap the rest. Note to self: don't bother wrapping more than 2-3 gifts for toddlers, they lose interest quickly, just set the rest out where they can get to them. Later we went to hubby's grandparent's house for a family dinner. It was good and fun. Now I'm tired from the long day. Tomorrow we are going home so I need to make sure we get everything all packed up and ready to go. I hope everyone has a wonderful day! I'm up early with Baby, just waiting for everyone else to wake up. Remember in the midst of all the gift-opening fun, the true reason for the season! Church today was wonderful. The program consisted of the congregation and choir singing Christmas hymns and the story of Christ's birth. It was beautiful. A few times I teared up because I was so touched. It was great to be surrounded by all those people celebrating the birth of our Savior. So I'm at the in-laws for the holiday. I'm very thankful they have the Internet, but I really hate dial-up. I don't know how people can live without high speed Internet! It's just not civilized! Good thing there's not much else to do here, because it takes forever for me to do anything on here now. I'm not sure why this quote stuck out to me so much. I guess I just feel that it is so important to have some knowledge of something. I've taken 3 yrs of college but never graduated because I couldn't decide what I wanted to do, but that doesn't mean I didn't learn alot. Because I changed my major 3 times I was able to learn a little in each of those areas, which was cool. Holy Cow! I passed 100 posts today and didn't even realize it! Woohoo! And over half of those posts were this month alone and it's not even over lol! Hard to believe a couple months ago I could care less about blogs, and now I'm a posting maniac! I got this from a messageboard I go to. discover an important, yet often overlooked, theological fact. the paper was festooned with pictures of Frosty the Snowman. based on a statistical survey of two guys I know. matter of principle never takes more than 15 seconds per gift. having babies that come more naturally to women than to men. recognizes it, you can claim that it's myrrh. mixture of food coloring and liquid starch. special time of year, is that you save the receipt." So I had hubby get out the clothes he wanted me to pack last night. We are going for 3 days. He got out 5 shirts and 2 pair of pants. I have so much to do today. We are leaving for the inlaws tonight to spend Christmas with them. I need to clean and pack before we go, plus I work tonight. I'm writing a to-do list so I don't forget something. * Somehow fit all the Christmas presents, luggage, etc, and us all in the car. Really not sure how to do that lol. * Have all that done by 4pm so we can leave as soon as hubby picks me up from work around 7. Hm, how about favorite Christmas music? I love the lyrics in "I Heard the Bells on Christmas Day", especially "God is not dead, nor doth he sleep. The wrong shall fail, the right prevail with peace on earth, goodwill to men." Trans-siberian Orchestra is just plain cool. The music to O Holy Night is beautiful and makes me cry. Baby, It's Cold Outside is a newer favorite, eversince I heard it on the movie Elf, I really like it. And I've always loved The Forgotten Carols. If you haven't heard that story you are really missing out. Really, who's idea was it to invent packing peanuts?! They are the most annoying, messy, horrible way to pack something in. If you want to tell someone you hate them, just send a package filled with packing peanuts, especially if they have a 2yr old. I had to clean up a mountain of them after 2 yr old decided to dump a huge box all over the office. He enjoyed them and even tried helping clean it up, but I could strangle the guy who sent us that package. 2) Christmas is almost here! What are you thankful for this beautiful day? Today I'm going to share another secret I got from a friend somewhere out in the digital world. If you are feeling crazed that you aren't getting everything done from you to-do lists, stop, set it down, and grab a clean sheet of paper. Start listing all the things you have done today, no matter how small. Woke up? Good! Brushed your teeth? Great! Got dressed? You are on your way! Everything, write it down. You will see that you really are accomplishing things, even if they are small. This helps me relax when I feel like I'm stressed to get so much done. You don't need to forget your to-do lists, just set it aside for a minute so you can appreciate how much you've already done. See how much I've done today and it's only 9:30am? 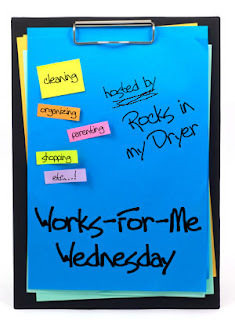 Check out Rocks In My Dryer for more Works-For-Me Wednesday tips! I love root beer, especially A&W, and I drink a lot of it when it's in the house. 2 yr old has picked up on my addiction and constantly asks me for some. But because his cute little 2yr old dialect is still developing, he doesn't get it quite right. "Beer please Mommy? Please beer?" At least he doesn't ask in public. I did almost this exact thing just 2 days ago. Someone called doing some survey that I really didn't want to take. Baby was playing happily in my lap, so I set him on the floor cuz I knew that would make him mad and scream, so I had an excuse to politely tell the surveyor I was busy. Does that make me a bad person? I don't remember much of what I heard today in church, 2 yr old was being noisy and I had to take him out of the meeting. But what I love about church this time of year is singing Christmas hymns. Today we sang The First Noel (we were late and missed the opening song). I love when the whole congregation is singing, filling the chapel with beautiful music. We also had a musical number of Away in a Manger that was beautiful. I need to find my Christmas CDs and put them on. Michelle and I got together and made these cute little treats to give as gifts. They are so easy and lots of fun, so it you want to make something to give to your neighbors, family, and friends here's a great idea! You can find directions to make them here. Skittles tagged me with this MEME. "The Five Questions Interview Game"
1. What have you learned so far from your visitors? 2. Did blogging change your life or your personality in any way? Well, I've only been at it a few months and I haven't seen any significant changes, but who knows, maybe I am a little more outgoing and witty. 3. Are you satisfied with what you’ve achieved this year, in general? Mostly yes. I had a baby (all naturally too), moved, bought a house, and learned to live in a new place. Most of my time is spent taking care of my kids, so I don't really do much for myself, but I'm glad I've been able to be with them. 4. If someone would offer to pay for a course for you, what course would you take?Maybe a photography course. I just got a reminder of why I haven't bothered to wrap Christmas presents yet. I have a 2 year old. Anyone with a 2 year old knows what a terror sweet little angel they can be. We only have 3 presents under our tree right now, one for hubby, one for 2yr old, and one for baby, all from my mom (I know, where's mine? She hasn't gotten it yet). I already knew what they were because she'd told me, but I'm trying to let the others be surprised. 2 year old evidently doesn't want to be surprised. Yesterday he ripped open baby's gift. I pieced the paper back together and taped it up haphazardly. Today he opened hubby's gift. Luckily hubby is not home and I was able to get it pieced back together too. I'm sure tomorrow it is his present's turn. I should probably just put them out of reach until Christmas but I'm too lazy I like the look of presents under the tree. I'm just glad none of mine are there. I want to be surprised! Updated: He opened baby's again, it is beginning to look like a Frankenstein present, taped together so grossly, edges sticking out where they never should have been. Arg, and it sounds like he's getting into his! * Go to hubby's work Christmas party. That doesn't sound like much but to get the fillings I first had to drop off the boys with my friend, go to the orthodontist to get my wires off, go to my appointment that took 2.5 hrs when it should've taken maybe an hour, pick up the boys, then at 2 I need to go back to the orthodontist to get my wires back on (plus a bracket the dentist broke off). I don't have the packing stuff I need for the packages we have to send, so don't know how I'm going to get that done. And the work party is an hour away so we have to leave early to get there. So it really is a busy day. Well, today I am 23 years young :D Should be a good day, except for the lack of sleep lol. 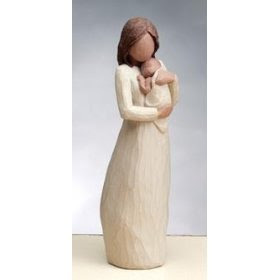 Sweet hubby gave me my presents, some Willow Tree figurines I'd wanted, one with a mom and baby, and one with a mom and little boy. They are so cute. We had cake and ice cream with the in-laws last night, yummy. And tonight we are going out to eat at Olive Garden, because that is my favorite restaurant and my mom gave me $50 to go. I don't feel any older, and I guess I'm still not very old yet. Mother-in-law was telling me last night that she had gotten married at my age, so it's kind of weird that I'm married with 2 kids already hahaha. Busy day planned. We got our Christmas tree decorated yesterday, and today hubby is going to put lights on the house. 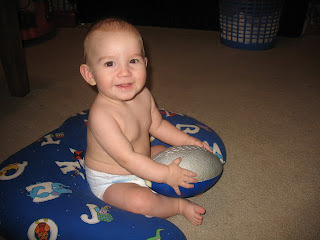 Then we have baby's 6 month appointment at 2, poor little guy gets shots. Then we are driving to Olive Garden, the closest one is 45 mins away. Tomorrow will be busy too. I have to get a few fillings at the dentist, yuck! Then Hubby's work Christmas party is at 6, but I need to leave here at 3:15 to pick him up at 4 from work, then drive the 1.5hrs to where the party is at. I don't know who planned for the party to be so far away, especially when they all have to be back to work the next day! Oh well, should be fun. I've been trying to think about something interesting to write about, but not having much luck. Either I'm just too tired to think, or there's just nothing interesting about me to write about lol. I tend to think it's the latter. Or maybe I have no imagination? That could be it. Whatever it is, I'm not going to think too hard on it tonight, I'm just too tired. Had a busy, fun day and now it's bedtime. Yes, it's only 9:12 but that's starting to feel later as I get older, I have a hard time staying up past 9pm these days. Great, 2yr old is going to wake up baby if I don't stop whatever he's doing :P Have a good night! "Writers seldom write the things they think. They simply write the things they think other folks think they think." Today is a Pajama Day for me. I have no plans to go out. The only person who might come over is Michelle and I don't care if she's sees me in my pj's lol. So I figure why dirty a good pair of clothes for nothing? My plans for today are keep the boys happy, do some laundry, maybe do the dishes, and find something to make for dinner. That's about it :) The boys are being good, just playing quietly. It's almost time for naps, and I think I will do some reading while they are asleep ("Sarah" by Orson Scott Card, amazing author). I love Pajama Days! E - Essential Item You Use Everyday? Computer of course! 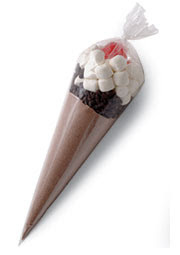 Today I think I'll do my favorite ice cream flavors, mmm! Well, time is up! Put down your pencils and pass your test to the front please! LOL! I'm so excited that today I can finally show all of the hard work I've been doing. This story actually begins 6 months ago when we moved. Everything that we didn't want to decide on where to put at the time got shoved into our storage room. Boxes were piled everywhere. We had to dig through, climb over, and rearrange any time we needed to find something. I knew it needed to get under control before it took over the house, and this challenge gave me the shove I needed to get started. And once I started I couldn't stop there! 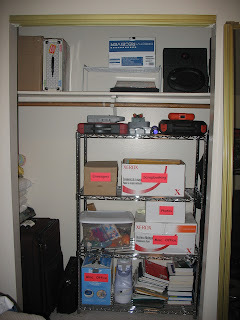 I ended up organizing my office closet and my boys' closet as well! 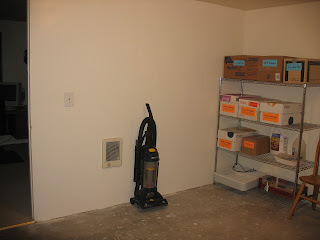 First I started by taking everything out of the storage room to give me a clean slate to work with. I sorted the junk into piles: empty boxes, food storage, sewing/yarn stuff, garbage, things to go in attic, and things that go in other rooms. This alone was quite a project. Then, everything that wasn't going back into the storage room got put in it's place and I boxed and labeled everything to put back. 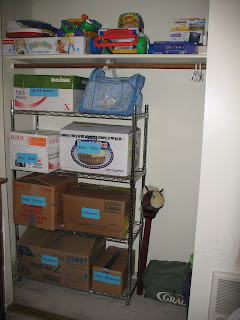 I love labeling, I think it is my favorite part lol, you'll see my brightly colored labels on most of the boxes. We didn't get our new shelves until yesterday so for a while they were just stacked nicely. But the shelves arrived yesterday! You should have seen how excited I was, I was practically jumping up and down! I got the first one put together and was so proud to show DH when he got home. I said "Isn't it beautiful?!" I think I might be a little strange lol. 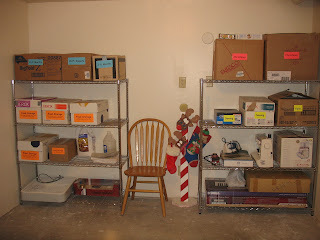 So then I stacked the boxes on the shelves nicely and cleaned up the laundry area. 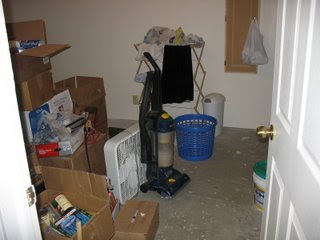 On the left I have baby things on the top shelf, food storage on the next 2, and a fan and doorknob thing on the bottom. On the right I have Christmas decorations on top, sewing and yarn supplies next down, serger and sweing maching and other items on the 3rd, and my keyboard and nativity set box on the bottom. There's a chair in there cuz we have a small kitchen and it won't fit, so we keep it down there. 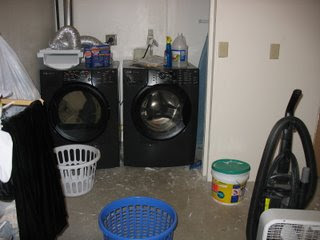 I was able to clear a ton off the washer/dryer and just left the essentials there. But that's not the end! Somehow our shelf order got messed up and they sent 2 extra shelves! So of course I had to find somewhere to use them. To the office I went. I dragged everything out, put 1 set of shelves in, neatly boxed, labeled, sorted, stacked, and otherwise organized the mess all into the most gorgeous closet I've seen! On the left side I have extra blankets and pillows stacked neatly behind that suitcase, on the right are jackets, my wedding dress, and some backpacks. The shelves have office supplies, computer stuff, school stuff, and craft stuff. And I can finally get to the tools (top shelf)when I need to! That's still not all! I had one more set of shelves so I headed to my boys' room. 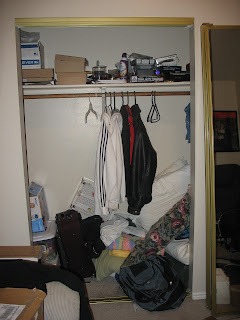 The closet was a mess and I'd been putting it off for too long. 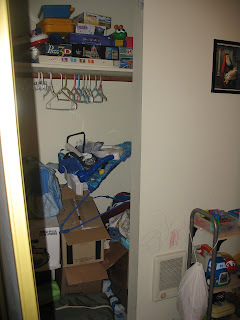 Again everything came out, the shelves went up, the room seemed to get messier by the minute, some things ended up in the storage room, the kids were wrecking havoc on the house, but eventually an organized haven of peace shone from the closet that I had been afraid to open before! 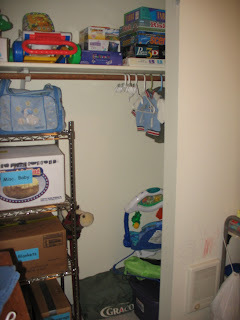 The shelves hold baby clothes, blankets, and other miscellaneous baby things. 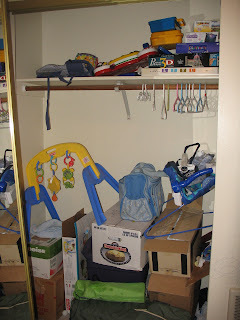 On the right are larger baby items that couldn't be shelved, and on the top are a few more toys and our board games. 3 boxes of clothes were put in the storage room until our next baby. 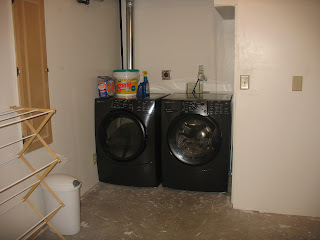 Now I'm exhausted, my fingers and back ache, my husband and kids think I'm completely nuts, but I'm so proud of myself! 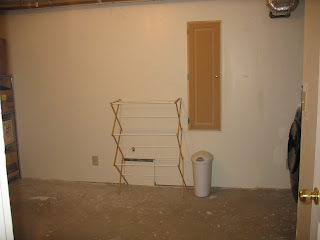 I keep going to the storage room and closets and just staring, they look so nice! The pics just don't do it justice, but I jsut realized you can click them to see them bigger and better. :) Now, what should I organize next?! Exotic and unusual, you are a bit of a rare bird - literally. You're known for being soft and succulent, though at times you can be a bit greasy. Well, here's the update on the post about my mom. She called today to talk to me about some other things, and also apologized for hanging up on me the other day. She's under a lot of stress (with her active life I'm not surprised, I'd be completely insane if I did half the stuff she does lol). So all's well on that front. The funny part was she called while I was blow drying my hair so I didn't hear the phone. About 15 minutes later I notice she had called and thought "Oh, great! Now she's going to think I'm purposely ignoring her!" So I gathered up my nerve and called back. No answer. So then I think "Now she's even madder at me and isn't going to answer." LOL She called back a few minutes later and wasn't mad at me at all. The sad part of the story is that my almost-sister (my mom has custody of her but she's not technically my sis) has run away. She evidently has a drinking problem we didn't know about, got drunk at a party and got frisky with some boy, and last night her and the foster girls all blew up at my mom and she ran away. She is only 15. I really hope they find her soon. I love her just like my own sisters and I'm just shocked by what has happened. Please keep her in your thoughts/prayers. She has already gone through so much in her life, I feel so bad for her. Today in Nursery they were singing "Wheels on the bus". The teacher asked the kids what the mommy on the bus says. 2 yr old piped up "No, no!" Hm, think he hears that from me too much? The teachers had a good laugh about it. 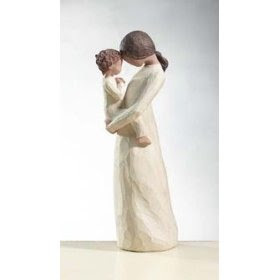 My whole life I've always tried to please my mom. This started when I was younger and she was physically and verbally abusive, so I did it to keep from getting hurt. She changed and stopped being abusive and really is a wonderful person, but she still finds ways to hurt me. I feel that she withdraws her love every time I do something she doesn't agree with. Today she called and we were talking about Christmas and my birthday. Then I told her about our trip to Cancun. She asked if she would get to watch the boys and I told her that I wanted her to but that DH had already asked his mom. The mood promptly changed. She said "I'm really offended by you. She (MIL) gets to see them anytime she wants. I'm done with this." and then hung up. Aaaaaaaaaaaaaaaaaaaaaaargh! I just don't understand why she does this to me. Makes me feel like a worthless piece of crap whenever she isn't happy. If we had the money I would take the boys to see her all the time, it's not like I want to keep them away from her. But MIL only lives an hour away so she comes more and gives us gas money to come see her. I just hate when she does this to me. I've had a pretty busy week. 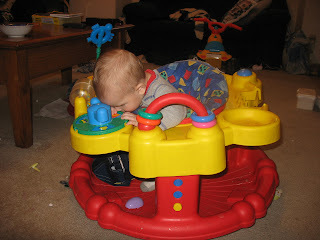 First there was baby being sick and teething. Then I've had to make about a bazillion trips to the post office, bank, library, or store. And top that with orthodontist and dentist appointments and trying to get some hats done, and it was pretty busy. I feel run down and need some sleep, and maybe some hot chocolate. One of my favorite messageboards had some drama yesterday, some people said some very mean things and one of the sweet ladies ended up leaving the board. It shocked and saddened me, these are my friends, and I couldn't believe the things that were being said. So I'm going to take a little break from that board to calm down about it, and hopefully things will get better eventually. I have a bunch to do today: job search (ugh, no, I don't want to, but you know), make some hats, go to the post office to mail a package or 2, go get the tires rotated on the car, go buy more yarn cuz everyone has been wanting the same color and I'm out of it, dishes, laundry, everyday cleanup of the house, and remember to go get my passport stuff done. It would all be fine except for having to drag the 2 boys along with me, that makes everything 10 times harder lol. Well, 2 yr old is making messes and baby is crying so I need to go get baby down for a nap and cleanup after 2yr old.